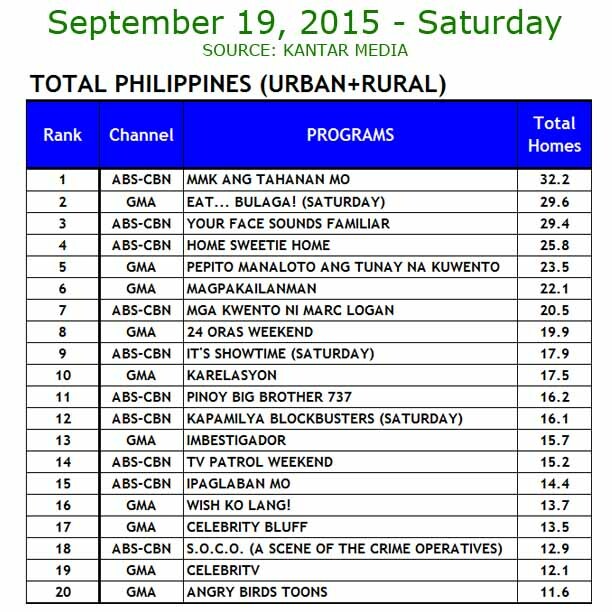 MANILA, Philippines - As the battle of noontime shows heats up with ABS-CBN's It's Showtime having 'Pastillas Girl' and GMA-7's Eat Bulaga with hit 'Kalyeserye' loveteam AlDub, their gap on national TV ratings narrowed over the past week (September 16-19, 2015). According to ratings provider Kantar Media, “It’s Showtime” maintained its slim gap against Eat Bulaga last Friday (Sep 18) with a national TV rating of 18.5% vs “Eat Bulaga” (20.6%). The Kapamilya noontime show maintained its strong rating at 17.9% last Saturday (Sep 19) despite Alden Richards and Maine Mendoza's 'most awaited date' episode. The 'Kalyeserye episode' on Saturday broke Twitter records with 12.1 million tweets. The strong viewership of It's Showtime last Saturday is attributed to Pastilas Girl or Angelica Yap's 'heart-breaking' meet-up with ex-boyfriend Enzo in the continuation of “Nasaan Ka Mr. Pastillas?” #TwitterSerye. Eat Bulaga's Joey de Leon threatens on 'Pastillas Girl' craze? Enzo surprised Pastillas Girl, the studio audience, televiewers, and even netizens when he agreed to go on stage live to put a closure. Among its local current subscribers are ABS-CBN, Peoples Television Network Inc., The Huddle Room Media Inc., JRA Advertising (J. Romero and Associates), 720 Consumer Connect, ZenithOptimedia, Viva Communications Inc., Manprom, Philippine Daily Inquirer , CNN Philippines, Starcom, Clubmedia, Havas Media Ortega, and Media Agency groups IPG Mediabrands (Touch BPN, UM), Dentsu Aegis Network (Dentsu, Mediaforce, Carat), Omnicom Media Group (OMD, PHD and M2M) as well as Group M (Mindshare, MEC, MediaCom, and Maxus).